Seventy-five experts from institutions in the U.S., Europe and Asia attended the workshop to discuss how data analytics can enhance power grid resilience. You may not know it when you turn on the light, but the power grid that delivers electricity to your home is getting smarter. With the addition of automation, digital communication and sensors along transmission lines, “smart grids” are getting more efficient at carrying electricity and faster at responding to outages. Such efficiency and speed is achieved partly by collecting lots of data on the health and performance of the power grid. Harnessing the power of data is therefore crucial to maintaining a well-functioning electric grid. Anurag Srivastava, associate professor in the WSU School of Electrical Engineering and Computer Science, organized an international workshop in August to bring together bright minds working in data science and power grid technology. 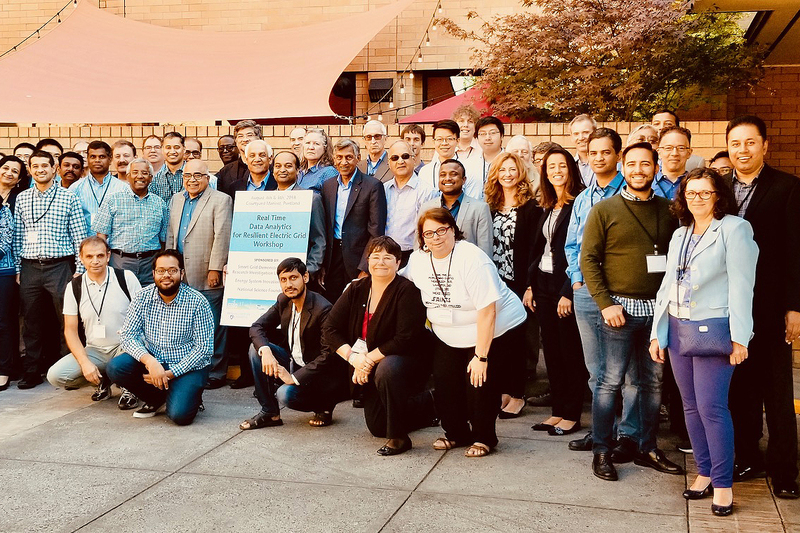 The participants met in Portland, Oregon, to discuss ways to use Big Data and data analytics to create efficient and resilient smart grids. “We wanted to have data scientists who were working on power grid problems exchanging ideas with power grid engineers and researchers,” said Srivastava. The main focus of the workshop, sponsored by the National Science Foundation, was using data analytics to enhance power grid resilience. Resilience is the ability of the power grid to resist and recover from interruptions and outages due to human causes or natural calamities, like Puerto Rico’s months-long blackout after Hurricane Maria earlier this year. This was the first major workshop where data scientists and power engineers came together to discuss power grid resilience, said Srivastava. As sensors are increasingly used to collect data about the grid, understanding data analytics and data-based real-time decision making becomes crucial. “Just as a doctor monitors the health of his or her patient, we are trying to do the same thing in real-time with the power grid,” he said. In addition, as the grid becomes more computerized, it becomes important to tackle cyber threats from hackers, viruses and malware. “With cyber systems used more and more in power grids, we have to deal with the issue of cyber-security,” he said. Seventy-five experts from institutions around the country and from Europe and Asia attended the invitation only workshop. “We can’t just rely on power grid researchers to prevent blackouts like the one in Puerto Rico,” said Srivastava, noting that it would require the use of weather, cybersystems and power grid data. “So we need data science experts to dig into all the available information, especially as the amount of data we obtain is increasing every year,” he said. Srivastava plans to organize more such workshops in the near future to help spread knowledge of best practices in ensuring continuous power supply to homes across the nation.